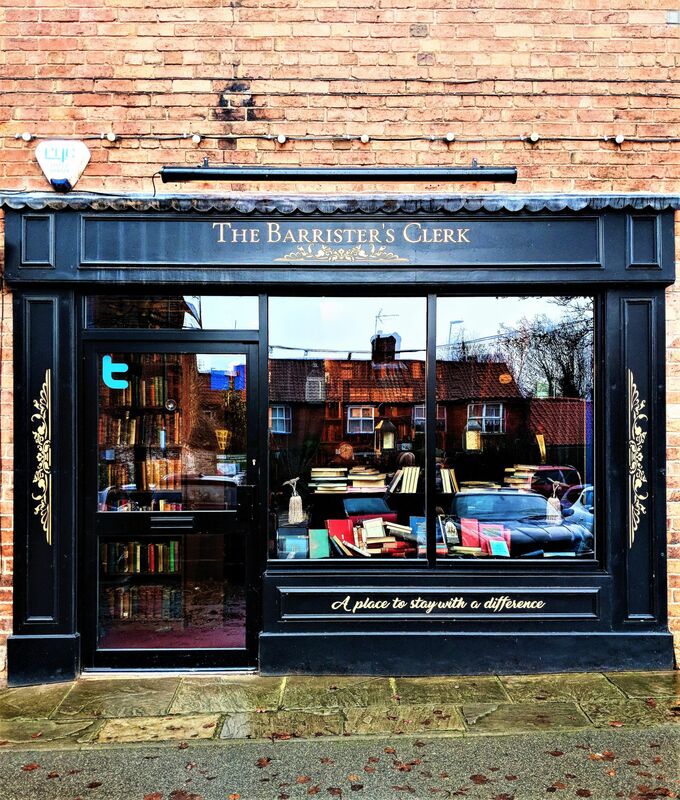 Full of vintage charm, it feels if the Barrister’s Book Chamber in Retford has been established for years but in fact this is one of the newer bookshops we’ve visited recently. We travelled to Nottinghamshire in early December after following the bookshop on Instagram for a few months and we picked our timing well. The shop was decked out in full festive style with nutcracker dolls, fireplaces and Christmas trees. The warm atmosphere was further accentuated by rich blue walls and rows upon rows of vintage hardback books. 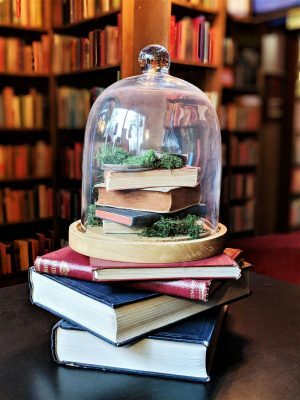 It was like walking into a Dickensian novel except here you can buy almost everything on display – including curated bookish gift boxes. It’s the kind of room you want to linger in , but there’s plenty more to see. After a lovely chat with Laura, the manager, I went to have a nosy. Rounding the corner, I discovered the antechamber which leads to the Library Tearoom. Even though this space is compact, it’s delightfully grand with a sumptuous chaise longue, an enormous mirror and a stock of legal texts. Angela, the owner is a qualified barrister (hence the bookshop name) with a passion for all things antiquated and you can see her connection to the world of the Bar throughout the premises. Although I was very tempted by cake at this point, I really wanted to explore the rest of the bookstore so I went to find Al and Little M who had already disappeared upstairs. The staircase is peppered with quotes and a replica of Dobby (from Harry Potter) points you to an equally enchanting first floor. The largest room is dominated by another beautiful wooden fireplace and is split into two sections ; one for contemporary fiction, the other for children’s fiction. As throughout the rest of the shop, all titles are secondhand and again, the attention to detail is fantastic. There are seats and tables everywhere as well as a little mail box where kids can post letters to their favourite characters and rummage in a ‘lucky dip’ suitcase. It has a truly welcoming feel and it was heartwarming to see this area full of families during our time there. If you prefer a more secluded spot then you can retreat to the non-fiction room next door. The second floor is still under construction. I can’t wait to see the transformation! Once you’ve browsed the bargains, you’ll definitely be in need of refreshment. The Library Tearoom offers a range of cakes and drinks on vintage china crockery. The shop doesn’t serve main meals, but if you fancy a snack then it’s ideal. There are gluten-free options too if you ask beforehand. Even better – you’re able to enjoy your food anywhere in the shop (remember that chaise longue I mentioned?). And if you get really comfortable you can stay overnight. The Barrister’s Book Chamber has been so successful that it moved into bigger premises this year. Rather than let go of the original building though, Angela and Laura had the genius idea to convert it into self-catering accommodation. We didn’t stay overnight this time but we were lucky enough to have a tour of the Clerk between bookings. The bookstore is still intact so if you want to have a go at running it then you can. The staff will provide you with a float. If not, well, you have all the books to yourself. The back room has two pianos and a sofa – perfect to chill out in. Upstairs there’s a big bedroom with a super king-size bed and an ensuite shower room. 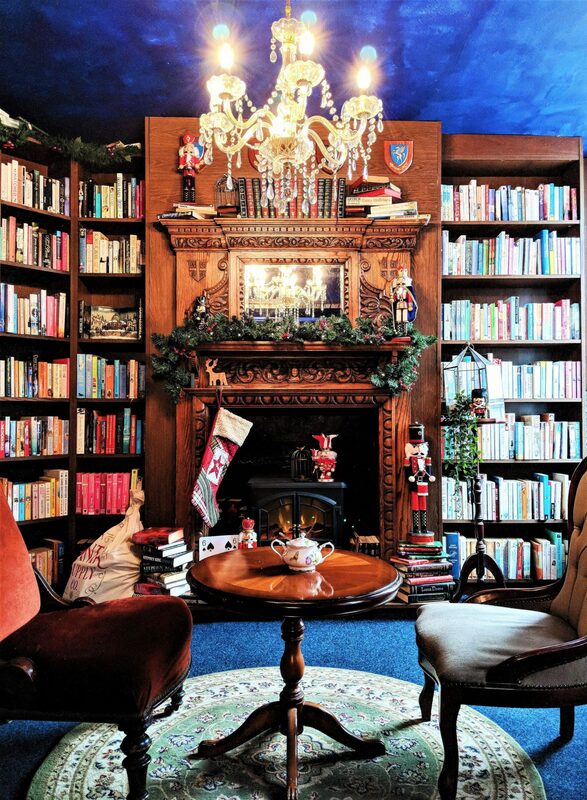 It goes without saying that there are books in every single alcove of this extraordinary property. Free Wi-Fi is included as is parking and your only a few steps from both the main bookshop and Retford town centre. At £45 a night, it’s a complete bargain and as one of the only places that you can stay in a bookshop in Britain, nights are selling out fast. If you’d like to give bookselling a go or simply retreat to your own private library then you can book it here. Having spent more than a few hours in the Barrister’s Book Chamber, we can understand why it’s so popular. Angela and Laura have created an enchanting escape that’s both luxurious and accessible. The books were some of the most affordable we’ve found on our travels – so much so that we ended up bring nine copies home with us. It was a pleasure to see a new bookish business thriving and providing a hub for the local community. Proof that independent bookshops, if designed thoughtfully and operated with warmth, are still very much in demand. We’re excited to return and hope that next time we’ll perhaps have a go at selling a few books ourselves! The Barrister’s Book Chamber welcomes children with open arms. Laura the manager used to be a nursery nurse and knows how to put kids at their ease. They can roam everywhere, but they will be most happy in the children’s area. The tearoom serves lots of tasty goodies and there are toilet facilities. If you’d like to combine this with other local attractions then Clumber Park, Sherwood Forest (of Robin Hood fame) and Creswell Crags are within 30 minutes’ drive. If you enjoyed this, you might like to see our other posts on bookshops. Next Post Mortal Engines Film Review – How Does it Compare to the Book?